SINGAPORE: Record sales of private homes here in July may push the 2009 total to an all-time high as local sentiment and global economic prospects improve, analysts said yesterday. A total of 2,767 apartments and houses were sold in July - the most ever sold in a single month - and this brought the total for the first seven months of this year to more than 10,000 units, according to official figures. The previous annual record of 14,811 units was set in 2007 and experts believe there is still pent-up demand from buyers sidelined by high prices that year and the financial crisis of 2008, when property sales dipped sharply. Buyer interest began to pick up in the first quarter of this year and exploded in the second quarter as developers launched affordable projects and foreign investors returned to the Singapore property market. "It (2009) is likely to beat the 2007 record of 14,811 units sold," said Chua Chor Hoon, head of Southeast Asia research at property advisers DTZ Debenham Tie Leung. Property purchases in August, a traditionally slow month for sales in Singapore, are still going strong with some projects sold out or close to selling out within one or two weeks of launch, she noted. "The general mood is that the worst is over and better times are coming. So buying activity will continue to be strong, unless there is a shock," Chua added. The government has warned that it may have to intervene if a property bubble forms due to speculation although most analysts do not expect any drastic measures unless housing prices spiral out of ordinary families' reach. Singapore's economic output is forecast to shrink by 4 to 6 per cent this year, but the city-state is now technically out of recession and back on a growth path. SINGAPORE: Southeast Asia's largest property developer CapitaLand said yesterday it was deploying S$1 billion of S$1.8 billion (S$1 = RM2.44) in capital raised from a recent rights issue to its businesses in China, Vietnam and the Ascott Group. It said S$500 million of the S$1 billion will go to its China arm, S$299 million to Vietnam and the remainder to Ascott, a wholly-owned unit that operates serviced apartments. The rest of the S$1.8 billion will be kept for further investment opportunities. "With the worst of the crisis behind us, and with a solid balance sheet, we are ... ready to embark on the next phase of our growth," CEO Liew Mun Leong said. WASHINGTON:US home construction saw a surprise decline in July, with both new starts and building permits suffering a drop after rising for two months, the Commerce Department said yesterday. Privately-owned housing starts fell at a seasonally adjusted annual rate of 1.0 per cent to 581,000 from the revised June estimate of 587,000. Building permits to construct privately-owned homes fell to a seasonally adjusted annual rate of 560,000, 1.8 per cent below the revised June rate of 570,000. 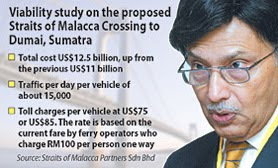 Straits of Malacca Partners Sdn Bhd (SOMP) has proposed to build a US$12.5 billion (RM44.3 billion) bridge connecting Malaysia and Indonesia, a project that was mooted 14 years ago. The bridge, which will be almost four times the length of the Penang Bridge, will cross the Straits of Malacca at the narrowest point between Malacca and Dumai, Sumatra in Indonesia. SOMP chairman Tan Sri Ibrahim Zain (picture) said the company has submitted the proposal, both to the Malaysian and Indonesian governments for approval. "We hope to secure the approval from the two governments by the end of this year or early 2010. "We need to start the project as soon as possible so that we would not pay higher construction materials cost," he told reporters after a special seminar on the 48.69km-long bridge in Kuala Lumpur yesterday. Ibrahim said 15 per cent of the funding for the project will come internally while the rest from bank borrowings. China's Exim Bank plans to support the bridge project. "Under the bank's policy, we can provide funding up to 85 per cent for such infrastructure projects," Exim Bank of China general manager Tang Yinlian said. A Chinese firm, Hunan Provincial Communications Planning, Survey and Design Institute (HNCDI), is also involved in the project. "Exim Bank of China sees the proposed Straits of Malacca bridge as one the biggest in the world and is a far-reaching programme for Malaysia and Indonesia as well as other countries in Southeast Asia," she said. SOMP has also proposed a joint committee at the government level for both countries to oversee security issues such as immigration and customs. Managing director Datuk Lim Sue Beng said apart from the bridge, HNCDI also proposed the construction of an underground tunnel that crosses the Straits of Malacca. Ibrahim and Lim are the major shareholders of SOMP. Malacca Chief Minister Datuk Seri Mohd Ali Rustam, who attended the seminar, said the proposed bridge will be the longest man-made link between two countries. "We know that besides government approvals, there are other issues such as land acquisition to be dealt with but that should not be a problem. "The bridge is a viable and profitable project, and expected to boost the economies of both countries," he said. He said Prime Minister Datuk Seri Mohd Najib Razak is supportive of the project, first mooted by former prime minister Tun Dr Mahathir Mohamad in 1995. It was shelved due to the Asian financial crisis in 1997. The bridge project was brought up during the Ninth Malay World Islamic Convention in Malacca in January this year.